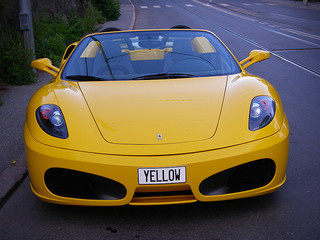 The Ferrari F430 sports car was launched in 2004 at the Paris Motor Show, whilst its stable mate, the F430 Spider, a two seater convertible version of the Berlinetta, was introduced in March 2005 at the Geneva Motor Show. Like the 355 Spider, the soft top was electrically actuated, and automatically folded away into a space in front of the engine compartment, which was displayed beneath a glass cover. The two-stage operation was very quick, in the order of some 20 seconds and, even when folded down, did not in any way obscure the view of the engine. 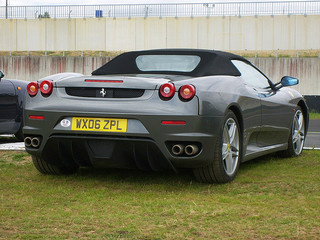 Like its predecessors, the F430 Series, including the Spider, was designed by Pininfarina. It was fitted with much larger air intakes at the rear to ensure maximum cooling of the new engine, due to the proximity of the folded down top. There were two air intakes at the front of the car which fed into a spoiler, positioned underneath the front bumper, which acted to channel air beneath the car. This helped to increase the ground effect, which was further improved by the presence of a large diffuser fitted to the rear, coupled with the fact that the underside of the car was completely flat. A new added feature was called the E-Diff and was, in fact, a limited slip differential that was computer activated to provide maximum grip when cornering, and so preventing wheel spin. A further addition was the Manettino switch, situated on the steering wheel, which allowed the driver to select a computer controlled function, according to road conditions, such as traction control via E-Diff, suspension, gear change speed, and throttle response. Ceramic composite disc brakes, with superior anti-fade characteristics, were available as an option, and the F1-style paddle shift gearbox was also offered. 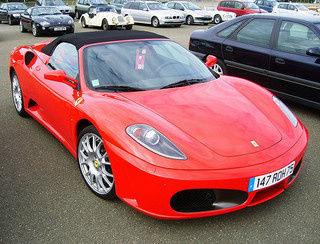 The F430 Spider shared the same interior as that of the Berlinetta. 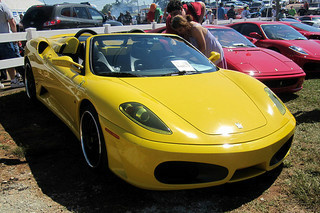 The F430 Spider was powered by the new 4.3 litre, V8 engine, with four valves per cylinder, unlike the five cylinder layout in the 360 Series. This larger engine developed 483 bhp at 8500 rpm (the redline), and 344 ft/lbs of torque at 5250 rpm. Compare with the coupe, this enabled the Spider to produce a top speed of 193 mph (3 mph slower), and a 0-60 mph time of 4.1 secs (2 secs longer). Originally priced at $200,000, a Ferrari F430 Spider in good condition would fetch around $100,000, whilst an example in excellent condition could command anything up to $150,000.